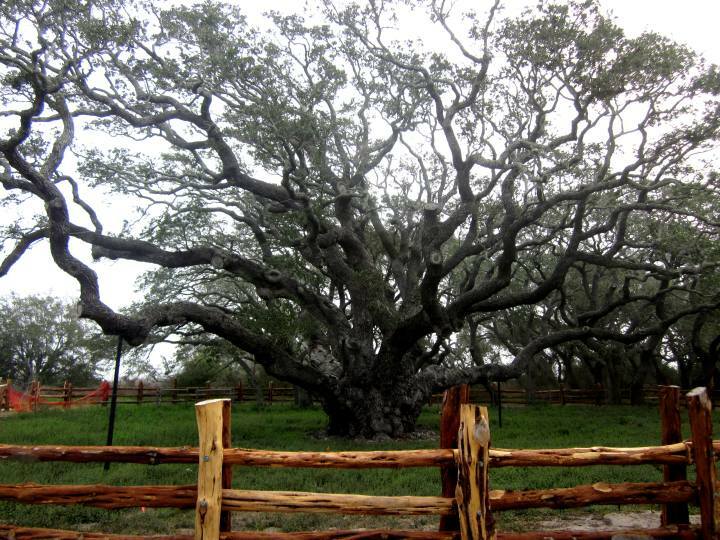 The Oldest Live Oak tree in Texas, known as The Big Tree, lives at Goose Island State Park near Rockport Texas. I paid a visit to the Big Tree in February on my way back from the coastal town of Port Aransas. 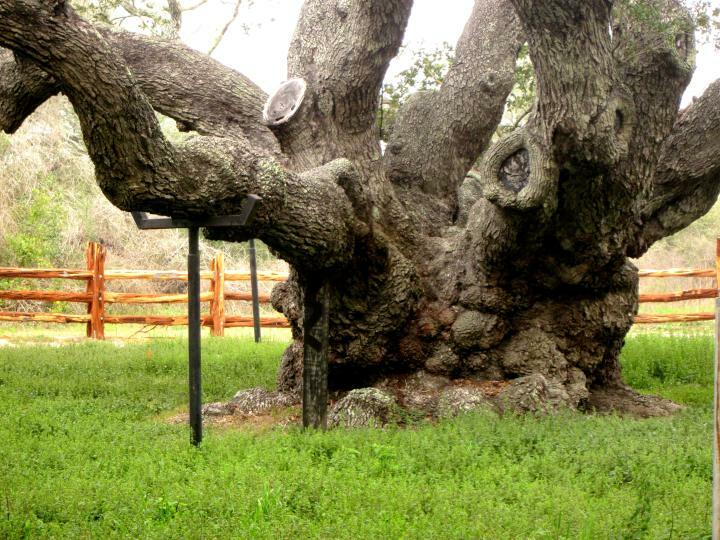 This old Texas oak tree is amazing! 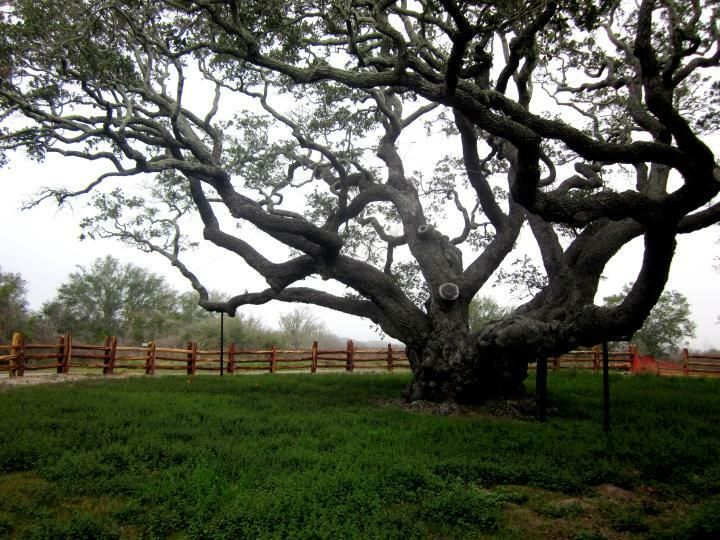 Although the Big Tree is no longer the largest tree in Texas it held the title of Texas State Champion Virginia Live Oak from 1969 to 2003. UPDATE: Sept 2017 – According to the Texas Parks and Wilflife Facebook page the Big Tree is still standing tall after hurricane Harvey. While I was visiting The Big Tree the park ranger and his wife happened to be visiting as well. I found out The Big Tree is not the tallest live oak in Texas due to the coastal winds hindering it’s growth. Still, this Goose Island oak tree is BIG and it is the oldest live oak tree in Texas. While we were chatting we heard a Whooping Crane call nearby – not that I could have identified it as such but the park ranger knew. Coastal Texas is home to many migrating birds so bring your birding binoculars and your best camera gear when you visit! The Big Tree is a Virginia Live Oak (Quercus virginiana), Live Oak are so-named due to the fact that they remain green and ‘live’ through winter when other oak trees are dormant and have lost their leaves. Virginia Live Oak are found in the warmer climates of the southeastern US from Virginia south to Florida, along the Gulf Coast to Texas. Virginia Live Oak is often called Southern Live Oak. The trunk of The Big Tree is over 35 feet (10.7 meters) in circumference and it is 44 feet (13.4 meters) tall. The Big Tree is estimated to be over 1,000 years old and up to 2,000 years old. I am a live oak tree and I am very old. I have seen spring return more than a thousand times. I can remember hundreds of hurricanes, most I’d rather forget, but I withstood. There was a big fire once. I have fires. Around me are my offspring. We are an old-dune woodland community. We provide shelter and acorns for squirrels, jays, raccoons, bobwhite, deer, javelina, and most other members of our community. For most of my life I belonged only to myself. Now I belong to you, or so I’m told. Humpf! Branch breakers and root tramplers the lot of you. Some years ago someone came and patched my cracks, trimmed my dead branches, killed my pests and healed my fungus rots. Was that you? I’m feeling much better, thank you. I am tired now. You may leave me in peace when you are ready to go. Please leave my home as you found it. I have important things to do. The seasons are changing again and I must get ready. Campsite rates start as low as $10 plus entrance fee. Call to make camping reservations: (512) 389-8900 or make a camping reservation online – you will need to create an account to make an online reservation. Your life must be very exciting with all the travelling. I admire the fact that you travel by yourself all the time. When I travel I also travel alone, but I have a destination with family or friends. I meet nice people on my journeys. At least most of the time. I really love oak trees and this one is very cool. Gorgeous oak tree!! tie a yellow ribbon …! Marcy, Funny that I never thought of that song – now it will be stuck in my head for days I’m sure! This is a magnificent item! That is a very huge tree. Affectionately known as ‘The Big Tree’ – a real beauty! O O Oh! This is wonderful. oh my gosh, that is beautiful…just amazing…i like the plaque too although it makes me feel a little sad for the old, tired tree! Magnificent!! I love the inscription on the plaque. These old trees are so amazing. It will be a sad day when it’s no longer there. It’s sad but it’s also just a part of the whole cycle of life – amazing that some trees live for a few thousand years! What an amazing tree. I love oaks and the life they support but had not heard of this variety. I think the oldest oak I’ve seen was 500 years old, a baby compared to this one. What a grand old Live Oak! He (no idea, I just ascribe Oaks as “he”) looks very much like the Great Oak of Sherwood in the UK right down to the enclosure of a low fence. May he see many more Autumns. The Big Tree of TEXAS! I live a few miles from that Big Tree and many years ago my mother from Waco visited that tree and found in the road an acorn that she planted in her small grreehouse in Waco, Texas. The growing tree in a pot was 6′ tall in 1984 and she took it with her when she moved to Portland, Texas after her husband died and she lived with me. She passed away in 1991 and that tree continues to grow in our front yard today where it reaches taller than the power lines in the street.! James, what a beautiful area of Texas you live in! 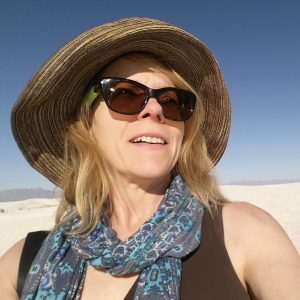 And what a beautiful story, thank you for sharing here on the blog. I love that your mom found the acorn and planted it, so lucky for you to have the tree in your front yard now, as a fond reminder of your mom.